I remember the moment when it began for me. I mean a new interest in the meaning of money. Just recently I was introduced to an important point of view on this matter by a woman named Lynne Twist. Unbeknownst to me, she had been a classmate at Stanford. My introduction to Lynne came about when a friend invited me to join her for a conference on “Ageless Living,” which was filmed for a PBS special. Over two days, there were a series of speakers representing major, out-of-the-box thinking about enduring human potential. Lynne Twist, author of The Soul of Money, was one of them, and she gave one of the most riveting and uplifting speeches I have ever heard. 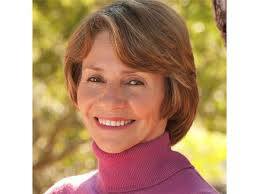 Lynne has devoted most of her life to philanthropy worldwide. As a result, she has had constant contact with both the extremely wealthy and some of the most impoverished, at-risk communities on earth. She has seen the shadow side of wealth, but she doesn’t condemn it. In her book she quotes Mother Teresa, who died in 1997, in this regard. Lynne had admired her from childhood and had a very meaningful encounter with her on this issue as an adult. 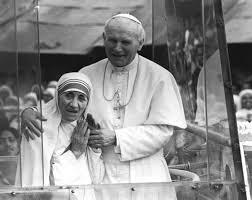 Mother Teresa spoke of “the deep poverty of the soul” that often afflicts the wealthy. She said that this poverty in America “was deeper than any poverty she had seen anywhere on earth.” She counseled Lynne to feel compassion for those so afflicted, and she does. Lynne wrote that the wealthy often suffer from loneliness, isolation, and hardening of the heart. She believes that three myths are the source of this suffering: (1) There’s not enough to go around. (2) More is better. (3) That’s just the way it is, and it will never change. In the first case, there is statistical evidence that we could provide for every person on earth, if we just chose to do so. In the second case, Jeff Bezos comes to mind. Best known as the founder, chairman, and CEO of Amazon, he is reportedly the richest man in the world, the richest there has ever been, and yet his commercial empire continues to expand, no end in sight. And finally, with regard to the last myth that nothing will ever change, Lynne’s message was that this is up to us. It’s going to be tough, though. The fact is that we live in a “money culture,” in which there is a significant focus on getting, having, growing, and keeping as much money as possible. This goal has gone higher profile over the last century due to economic disasters like the Great Depression and the Great Recession. Ironically, it is in conflict with an aggressive consumer culture that got a huge boost after 9/11. Lynne’s book was published in 2003, and she reminds the reader of how, post 9/11, President George W. Bush called on Americans to support the economy by getting back to the business of spending money. “Shopping was portrayed as an expression of patriotism, a way to show the terrorists that they could not destroy our economy, our consumerism, the American spirit, or the American way of life.” At the same time, the dark genius behind the credit card encourages us to spend money we don’t even have. We are also harassed nonstop by advertising on the radio, TV, and computer screens, and in newspapers, magazines, catalogs, and our mailboxes–virtually everywhere we turn. Lynne also points out how marketers are early targeting the young to inculcate them into aggressive consumerism. Shopping remains a patriotic activity in our minds, a way to serve the goal of perpetual economic growth that is also a myth. 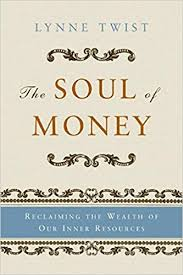 It’s interesting that The Soul of Money has become so timely 15 years after its publication. As I said, this is due to the fact that the topic of money/wealth has been extremely high profile ever since the last election. There’s a good chance that something definitive may emerge from this experience, so we might as well start thinking about it in new ways. And of course this all boils down in the moment to whether achievements in the business world signify gifts the nation needs in a president, so I did a little research. I found what seemed a valuable resource in the 2014 ranking of presidents by the American Political Science Association (“the premier organization of experts on the American presidency”). According to this group, the most successful post-19th century presidents were in order as follows: Franklin D. Roosevelt, Theodore Roosevelt, Harry Truman, Dwight D. Eisenhower, Bill Clinton, Woodrow Wilson, Ronald Reagan. Lyndon B. Johnson, John F. Kennedy, George H.W. Bush, Barack Obama, and Gerald Ford. Only George H.W. Bush was a businessman (an oil man). The top professions among the most revered presidents have been in the fields of law and politics. In conclusion and back to Lynne Twist, she points out that money is neither evil nor good but an instrument that we created. The opportunity is to learn how to use it in a whole new way to serve the transformation we would like to see in our troubled world. That applies to how we invest and spend every dollar down to every single penny. Becoming this conscious sounds a little nerve-racking, but maybe it’s time. And perhaps we will ultimately feel very grateful for the president who inspired the ensuing transformation.